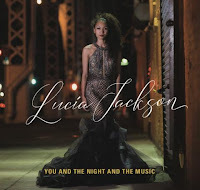 Lucia Jackson (vocals); Ron Jackson (guitars, arrangements); Yago Vasquez (piano); Matt Clohesy (bass); Corey Rawls (drums) + Yaacov Mayman (ten sax track 5); Javier Sanchez (bandoneon track 6); Frederika Krier (violin track 6); Dan Garcia (guitars track 7); Samuel Torres (perc track 7). Lucia Jackson, a native New Yorker who studied dance in Madrid, has also worked as a dancer and model. This, her debut CD, has arrangements by Ron Jackson (her father) of mainly GASbook material some with a Latin twist as well as The Beatles’ And I Love Him, and a number by Ms Jackson herself Feel The Love. Here is yet another fine woman singer with a more than capable band, and we should be glad. Just One Of Those Things, begins Ms Jackson, clear-voiced vocals and the band are straight in with 4s, followed by a Latinesque Beautiful Love and a song, new to me, called Issues (Julie Michaels): ‘I got issues, you got them too, give them to me and I’ll give mine to you’, lyrically very up to date stuff. And I Love Him is a slow pensive ballad, sung just with guitar, fading out at the end. You and the Night and the Music features a swirling tenor sax, and I’m a Fool to Want you is a tango with a passionate violin and bandoneon (sounds like a smaller accordion) accompaniment. Feel the Love was written for Ms Jackson’s brother, and features flamenco guitar. The final track is When You’re Smiling, a song that our singer associates with her parents, and the only track on which she scats, which she does well. Other tracks are: Sophisticated Lady; No Regrets; Never Let Me Go; I Fall in Love Too Easily and Toda Una Vida. *Lance has promised to squeeze me into the car next year!